Do you know Lebron James? If you don't know, let me tell you... hehe! LeBron James is an American professional basketball player for the Cleveland Cavaliers of the National Basketball Association(NBA). Nike is paying Lebron James for endorsement. Well if you guys notice that the Micheal Jordan products in Nike boutiques are getting lesser compared to Lebron James. Will Nike stop endorsement deal with Micheal Jordan in future? 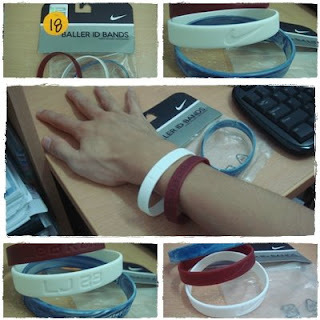 I bought this when the staff of Nike told me it is limited edition LeBron James baller ID band. It cost RM18 for 3 band. Do give some comment... hehe!